It is believed that they are capable of survival for a long time without drinking water. Sand cats live a solitary life, except during the mating period. They are one of the hardest cat species to breed in captivity. More than 4 in 10 cats bred in captivity die at a young age. They are mainly nocturnal animals, making them even harder to study. There are less than 200 sand cats currently held in zoos only. 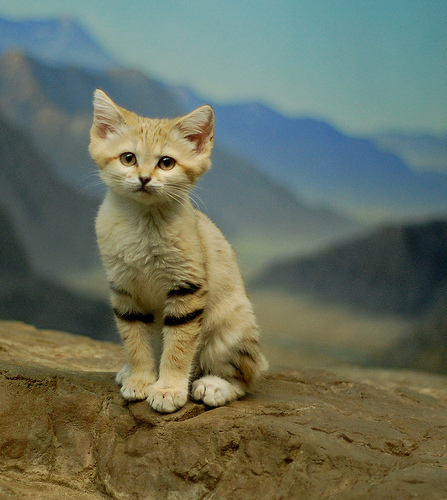 While most cats have good hearing, sand cats have developed their hearing even more. This allows them to hunt for prey. Besides eating small rodents, sand cats also hunt poisonous snakes, especially sand vipers. According to the Koran, a sand cat was the companion of the prophet Mohammed and his daughter during their trip in the desert. It is also sometimes named the “sand dune cat”. It has thick hair on its soles, making it more adapted to the harsh extreme weather of the desert. In captivity it was observed that after a meal the cat buries its leftovers in the sand. Although most cats are found in the Sahara Desert, some sand cats also live in parts of Iran, Pakistan or Turkmenistan. Predators of the cat are snakes, wild dogs or birds of prey in some cases. The cats were first discovered and described in 1858 by a French naturalist, Victor Loche. Sand cats can survive with very little or no water if they get the necessary liquids from their prey’s body.